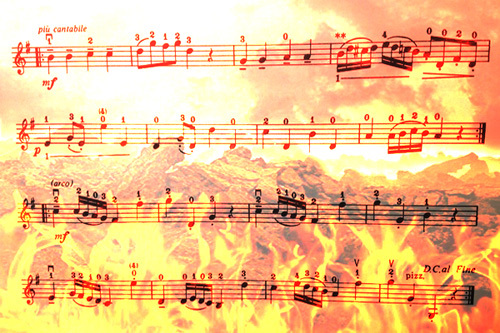 Gossec Gavotte: Song from Hell or Heaven Sent? As a teacher, I find the song quite magical; it contains several passages that enable me to read the mind of a young violinist, and to surmise much about his “musical parenting” as well. Seven year old John, might think (or even verbalize) “this is beyond me.” Hence, he’ll play and improve the large part of song for week upon week, though the execution of this particular passage itself never seems to change much. He has metaphorically left the room and shut off the lights. Completion of this project was filed in the “someday” or “never” category. Enter six year old Susan, an equally skilled student. Upon facing the same passage, she experiences a completely different internal dialog. “My family and teacher gave me this age appropriate problem, and so they expect me to solve it.” And before long, the “impossibly” difficult passage, looks pretty much like the rest of the song. Both Susan and John have yet to develop a mature practice strategy, yet Susan’s “I can solve this now” belief system stimulates a vastly higher quality of work on her part. If only by a process of elimination, she will ultimately discover one or more keys to unlock the difficulties in the notes. The confident six year old recitalist who can easily and brilliantly perform Gossec almost automatically gets the “talented” label. This, as if only the chosen few were fortunate enough to end up on the planet with the super-prodigy-violinist gene. Well let me just say, this just isn’t so. Any six year old with average motor skills has the ability to pull off the Book 1 Gavotte. The wise family sees music as a journey of self discovery that gives a child something far beyond a “fun” activity, far beyond mere self-esteem. Many a family sees their children’s music lessons as just one more extracurricular activity that happens to be centered around playing songs on an instrument. The wise family sees music as a journey of self discovery that gives a child something far beyond a “fun” activity, far beyond mere self-esteem. 1. Don’t use the T word. It will only make you kids think they “have it” or don’t. Either way, the result will kill the motivation to improve. 2. Don’t pamper your kids with praise for their half-hearted efforts. Instead, be the benevolent dictator that helps them discover their own ability to solve problems and succeed. Music may not always be fun, but at times can bring joy, bliss and elation, when mastered. 3. As a parent, part of your job is to keep the kids motivated and excited about their music lessons. Why would they be enthusiastic, if your head is buried in a magazine during the entire lesson, if you never take them to a great concert, or if you’re indifferent to the topic of music in general? Be it Gossec Gavotte or the Sibelius Concerto, the challenge of continual progress is truly met within our minds. For the student and the family, we must always expect quality work, continual improvement and a sense of focused ease while practicing. As a parent, you are the hero that must make it happen. What are your thoughts about kids and music? Please add a comment below. Thanks! What is my violin worth? Is your violin a Strad? Could that violin you’ve been storing in the closet be a Strad worth millions? There are literally millions of violins in existence that bear the label Antonius Stradivarius; they’re almost all copies of the classic “Strad” model made famous by the master from Cremona, Italy. 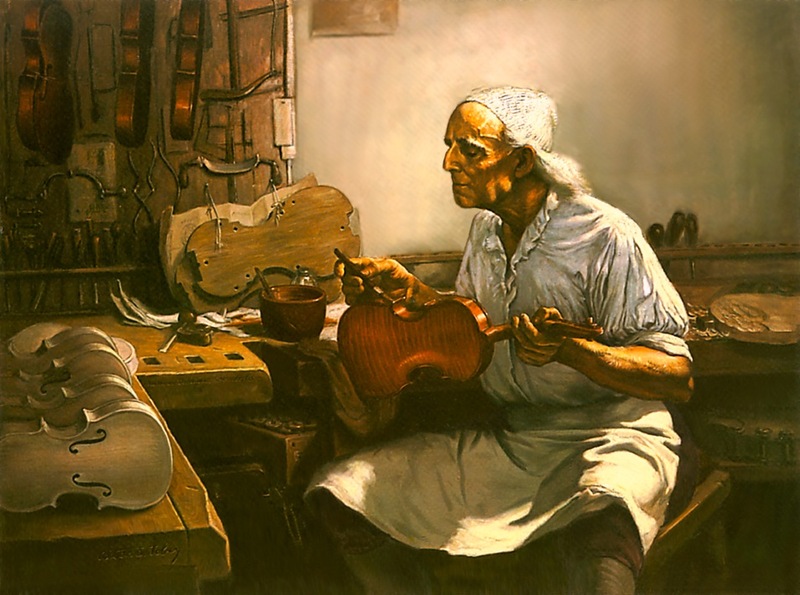 Antonio Stradivari handcrafted about 700 instruments during his lifetime. All but 100 are accounted for. Even though your instrument may not be a real Strad, it still may have considerable value. Strad copies range from junk level factory made instruments to very fine handmade violins worth thousands of dollars. The maker, construction and condition of your instrument all go into determining its value. The best way to determine the value of a violin is to get an appraisal from a violin shop (luthier.) He or she will be able to determine the authenticity of your instrument, the cost of needed repairs and an approximate market value. A more formal written appraisal might be warranted if you own a fine instrument. You should expect to pay a fee for such an appraisal. The greatest value your violin might hold is the joy it can bring you when you play it. Fix it up; get some lessons and make some music!